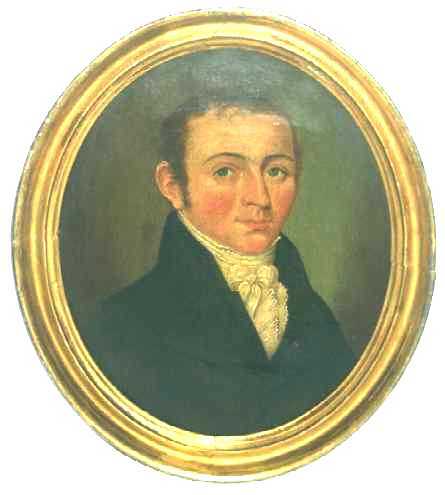 Presented here, a nice little academic oval head and shoulders portrait of a green eyed gentleman with good complexion wearing a high collared coat, white cravat and ruffled shirt. Presented in an oval gilt frame that appears to be original. The painting is in untouched original condition with the exception of one tiny area that has been repaired in the lower right on his coat. The white pine stretcher is carved and pinned and is original to the piece. The frame has separated somewhat at the joints and there are some losses to the gilt surface. All in all, a handsome work with a nice attitude and great condition.